This article is about the location in South Australia. For the archdeacon, see William Creek (archdeacon). William Creek, Australia is located halfway on the Oodnadatta Track, 210 kilometres north west of Marree and 166 kilometres east of Coober Pedy in South Australia. The town has a population of 10. William Creek is in the federal Division of Grey and the state electorate of Stuart. It is outside of council areas, and administered by the Outback Communities Authority. William Creek is the entry point from Coober Pedy to Lake Eyre in the Tirari Desert. William Creek offers the only petrol station between Marree, Coober Pedy and Oodnadatta on the Oodnadatta Track and has a campground, two motels and one of the world's most remote pubs. The world's largest cattle station is located in nearby Anna Creek Station  and the Woomera Prohibited Area, former testing ground for atomic weapons, is also nearby. William Creek is serviced twice weekly by the Coober Pedy Oodnadatta One Day Mail Run. The 4WD mail truck also carries some general freight and passengers. William Creek was named in November 1859 by explorer John McDouall Stuart during his expeditions in the area. William was the second son of John Chambers, a pioneer pastoralist of South Australia and a strong ally of Stuart. The town was once on The Ghan railway line. The town has always been small: never larger than a few cottages, a small school and a Hotel-store. The historic William Creek Hotel is listed on the South Australian Heritage Register. Lake Eyre can be seen from several vantage points along the Oodnadatta Track and appears as a large, rather featureless, white saltpan. It is only from the air that its immensity can be appreciated. The curvature of the Earth can be seen on the horizon and beneath it is possible to identify the courses of the ancient rivers that still occasionally flow into the lake. Trevor Wright and the pilots from Wrightsair  take up to five passengers for a 60-minute flight out of William Creek, passing over the spectacular Painted Hills to the west, then along the southern edge of the lake, pointing out the features beneath and explaining the topography. The Painted Hills are brilliantly coloured eroded sandstone ridges. These, and all of the country traversed in the one-hour flight, are part of Anna Creek Station. From the air the Track can be seen, stretching to the horizon in two directions. ^ "2016 Census QuickStats: William Creek". Australian Bureau of Statistics. 2016. Retrieved 2017-12-03. ^ "Search result for "William Creek (LOCB)" (Record no SA0025514) with the following layers selected - "Suburbs and Localities" and "Place names (gazetter)"". Property Location Browser. Government of South Australia. Retrieved 19 May 2016. ^ "Coober Pedy - William Creek - Opal Capital of The World". 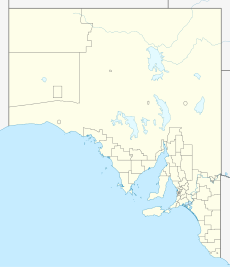 cooberpedy.sa.gov.au. Retrieved 2014-02-20. ^ a b c d Collins Anderson Management (2001). "William Creek Community Plan" (pdf (38 pages)). South Australian Government. Retrieved 2008-06-23. ^ "Finding of inquest into death of Gabriele Grossmueller". South Australian Coroner. 10 March 2000. Retrieved 2008-06-23. ^ "Black Arrow: UK space rocket returns home from Australia". BBC News. BBC. 21 January 2019. Retrieved 21 January 2019. ^ "Coober Pedy - William Creek - Oodnadatta One Day Mail Run Tour". ^ "William Creek Hotel". South Australian Heritage Register. Department of Environment, Water and Natural Resources. Retrieved 12 February 2016. ^ "Flights over amazing Lake Eyre and the Painted Hills". Wikimedia Commons has media related to William Creek, South Australia. This page was last edited on 21 January 2019, at 18:25 (UTC).